I’ve been looking at the Web page of Hungary’s Museum of Electrical Technology. A fascinating site, pity it’s in Hungarian only. The Museum has many permanent exhibitions, one of which is about the technology of electrical lighting. 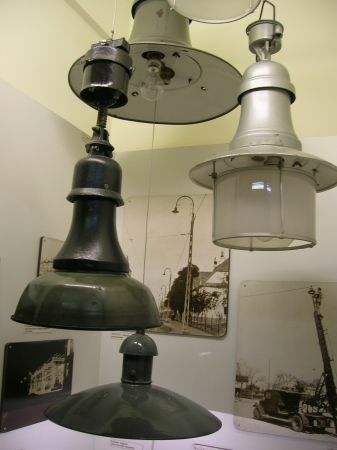 One of the pictures available online shows some period lighting fixtures. Fixtures like these were still seen on many Budapest streets when I was a child. I don’t know if it’s just me, but I find these lighting fixtures rather unfriendly in appearance, hostile even. It is almost as if their main purpose was not to provide comfort through light, but to intimidate. Exactly 60 years ago, on August 29, 1949, the Soviet Union exploded their first nuclear bomb in the Semipalatinsk test field located in present-day Kazakhstan. The nuclear cold war began. Some forty years later, the cold war supposedly ended, but the vast nuclear arsenals are still there, ready to be deployed on a moment’s notice… so I am not sure what, if anything, has changed in the last 20 years other than the fact that the weapons systems are now older and less reliable… which is not exactly reassuring. I’ve been reading about the Budapest subway and I found out that it is available as a package for the BVE train simulator. With a moderate amount of effort, I downloaded the software and put it to work, and presto… I was driving M2 through Budapest, from the Southern Railway Station all the way to the eastern part of the city. Then I drove for a second time, but this time around I didn’t stop at any of the stations and ignored all the signals. I’m allowed to… it is just a game. Yet I felt terribly guilty all along, as if afraid that I might get caught or something. Inhibitions are a strange thing. I’m reading the autobiography of Fred Hoyle, and I’ve been perusing Wikipedia for background, in particular, reading about the Jodrell Bank radio telescope and its founder, Sir Bernard Lovell. This is how I came across a news item from earlier this year, according to which Lovell recently revealed that back in 1963, he has been targeted by Soviet assassins during a visit to the Soviet Union. This sounds improbable except… even in recent years, Russian intelligence agents/agencies have been using novel methods in assassination attempts (e.g., radioactive polonium in the case of Litvinenko). Further, the rationale Lovell gives is quite plausible: back in 1963, when satellite-based early warning systems were not yet available, something like Jodrell Bank may very well have served either as an over-the-horizon radar or perhaps using the Moon as a reflector. Lovell promises to reveal more posthumously. What can I say? Our curiosity can wait. I wish him many more happy and healthy years. An inexplicable disaster destroyed the turbines of Russia’s largest hydroelectric plant, killing many workers and putting the plant out of commission for years. According to official reports, the aging infrastructure is to blame, but apparently, a Chechen terrorist group also claimed responsibility. Russian officials deny this, but it’s hard to decide whom to believe, since they don’t exactly have a spotless track record when it comes to truthtelling. Yet on the other hand, even if they lie, perhaps it’s the right thing to do in this case. Terrorism, by definition, relies on publicity to achieve its intended purpose; it can be fought most effectively by denying that publicity. Of course if you actually want to fight, an act of terrorism may be precisely what you need to justify a war. Which, I suspect, is just what happened back in 2001, when America’s political leadership, inspired by the ideology of the Project for the New American Century, used the terrorist attacks as pretext to launch its neverending “war on terrorism“, complete with the illegal war in Iraq, secret indefinite detentions on communist Cuba’s soil, torture, and deportations. Now I think I know why Rogers were so perplexed when Ottawa viewers like me complained about the planned change in its cable lineup, replacing WPBS from Watertown with a Detroit PBS channel. You see, they must have known all along that we won’t be watching either. Although they were citing signal quality as the reason for the planned change, reality is that the signal quality on cable channel 64 was just fine. I never had any problems watching WPBS there. However, now that they moved this and two other channels to the 95-97 range (cable channels that happen to coincide in frequency with FM radio) this is no longer true: the signal quality on these channels is just unacceptable. I phoned them and they wanted to send a technician. I talked them out of that. Now my only hope is that some of my neighbors will phone also, and they escalate the problem. Or maybe it’s time to dump cable TV after all and just get satellite? The main reason why I am keeping cable is the convenience if a set-top-box-less existence… if I need a set-top box, I might as well stick with digital cable. But set-top boxes are such a nuisance, especially when used together with a computer tuner card. Perhaps it’s time to return to a good old-fashioned aerial. Never mind analog TV, I can get some HD digital channels even with a tiny indoor antenna… who knows what a decent aerial might do? Can things get weirder in Gaza? The news tonight is that the security forces of Hamas destroyed an Al-Qaeda group in a violent clash. Hamas is supposedly a terrorist organization… but it seems that there is terrorism and there is terrorism. While Hamas may not refrain from the use of suicide bombers and whatnot in its struggle against Israel, it seems that Hamas leaders were not particularly interested in promoting Al-Qaeda’s global Caliphate. I’m watching Cubers on the CBC, a documentary about the revival of interest in Rubik’s Cube, and a recent Rubik’s Cube solvers’ competition. What can I say… it takes me back. I wouldn’t stand a chance competing in this crowd, but I did win the world’s first (as far as I know) Rubik’s Cube competition, held in Budapest in 1980. I completed my cube in 55 seconds, which wasn’t a very good time by my standards then (I often managed to solve the cube in well under 30 seconds) but it was enough to win. These days, world class competitors solve the cube in 15 seconds or less. In addition to manual dexterity, such spectacular performances also require memorizing a large number of moves. And then I am not even going to mention the blindfold competitions, involving not just the “standard” 3×3×3 cube but the larger, 4×4×4 and 5×5×5 versions… such skills are hard to comprehend. I can still solve my (3×3×3) cube without trouble (so long as I am allowed to use my eyes), but I only remember a relatively modest number of moves, which means that my solution is far from efficient. In other words… I am rusty. And my cube is sticky. Literally, it feels sticky on the outside (is the plastic decomposing?) and it’s a bit hard to turn. Still, on the third try, I managed to solve it in a minute an 45 seconds. Not bad, considering that I haven’t touched the thing in years. Nortel’s CEO has quit. But the company is in good shape, he says: after all, it is “stabilized”. Isn’t that a little like the surgeon showing up at a patient’s funeral, boasting that as a result of his expert attention, the patient’s condition is fully stabilized? I discovered this last year completely by accident, when I went for a late evening walk… imagine a park, usually dark at night, illuminated by a myriad of faint lanterns hanging from the trees and whatnot. It was a magical experience, made even more so that it was completely unexpected… I did not know about the Lumiere Festival at the time. This year, I took my wife along. We went a little earlier. Perhaps that was a mistake… perhaps the crowds just got bigger since last year. But crowds are one thing. It’s another thing altogether that just about every second (! ), I was blinded by someone’s camera flash. Now I will not go on about the pointless stupidity of using a camera flash when you’re trying to photograph faint lanterns in the dark, as I got past that some forty years ago, at the age of six or thereabouts, when I was watching an ice skating event on television, complete with spectators using camera flashes high up in the seating area, perhaps hundreds of feet away from the competitors they were trying to photograph. No, it’s the inconsiderateness that bugged me. The blasted flashes made it impossible to enjoy the sights… every time I stared at a faint lantern, trying to discern its shape (and some of them were quite beautiful and elaborate) some idiot flashed his camera in my face. At one point, I could stand it no more, and yelled back at the dark, in the direction of the multicolored swirl that was still on my retina, telling the unseen photographer that he is ruining it for everyone with the stupid flashes. In retrospect, I realize that I sounded just like Victor Meldrew from the British comedy, One Foot in the Grave. So much for the promise I made to myself years ago about not joining the club of grumpy old men prematurely! Is this true? And does this mean that Russian hackers (with possible support from Russia’s government) are behind this? And, if such attacks on the global IT infrastructure become more frequent, what can the world do? Firewall Russia off the Internet? It may be feasible to do so technologically, but it also amounts to a kind of a “nuclear option”. However, as the Internet is becoming ever more vital, if there are “rogue nations” that refuse to police online criminals within their borders (or perhaps even actively support them) the “nuclear option” may very well be the only practical alternative. I built myself this dual-core computer several years ago, and it has been my main workstation ever since. By and large, it’s a good and reliable machine (not counting a broken fan and some fried capacitors on its motherboard… never mind, I now have spares of the same motherboard just to be safe) but there have always been a few minor glitches. One of those glitches concerned MIDI files… if I played back a MIDI file on this computer, its tempo was all off. That is, unless I set the processor affinity of the MIDI playback program to play back only on a specific CPU core. Go figure. If that’s the worst problem I have on a machine that otherwise runs for months without a reboot despite being used for everything from software development to video editing, I guess I can call myself lucky. But now, years later, I ran into another curious problem. There’s this computer game from the 90s, Duke Nukem, that I, for some reason, still find quite enjoyable. I usually run it on an old Windows 98 box. Recently I found out that there is an open source effort to develop and maintain a multiplatform Duke Nukem executable. I downloaded it and tested it on a test machine… it worked fine. So the other day, I put it on my main machine. It didn’t work fine… if I hit a key on the keyboard, it registered as a large number of very rapid keystrokes to the program. Someone wrote to me about inkblots. Apparently, the topic has become hot, in response to the decision by Wikipedia editors to make the Rorschach blots available online. Attempts by some to suppress this information using, among other things, questionable copyright claims, are of a distinctively Scientologist flavor (made all the more curious by Scientology’s rejection of conventional psychoanalysis.) They do have a point, though… the validity of the test could be undermined if test subjects were familiar with the inkblots and evaluation methods. On the other hand, one cannot help but wonder why such an outdated test is still being used in daily practice. It certainly gives credence to those who consider psychoanalysis a pseudoscience. I am also wondering… suppose I build a sophisticated software system with optical pattern recognition, associative memory, and a learning algorithm. Suppose the software is buggy, and I wish to test it. Would I be testing it by running the recognition program on meaningless symmetric patterns? The behavior of the system would be random, but perhaps not completely so; it may be a case of ordered chaos with a well defined attractor. Would running the recognition program on a few select images reveal anything about that attractor? Would it reveal enough information to determine reliably if the attractor differs from whatever would be considered “normal”? More importantly, do practitioners of the Rorschach test know about chaos dynamics and do they have the correct (mathematical, computer) tools to analyze their findings? I am also wondering how such a test could be conceivably normalized to account for differences in life experience (or, to use my software system example, for differences in the training of the learning algorithm) but I better shut up now before my thoughts turn into opinionated rantings about a subject that I know precious little about. Canadian astronaut Julie Payette is safely back on terra firma. During the post-mission press conference, she described the environment in which the International Space Station has been constructed, i.e., space, as “one of the most hostile”. Compare this to the bottom of the ocean. How long would you survive under a pressure of several hundred atmospheres? Or consider the crater of an active volcano. How many seconds of consciousness would you enjoy before your body is vaporized? And then I have not even considered something like the surface of the Sun (not to mention its interior.) Talk about hostile! The thing is, space is hostile alright, but we are creatures of the near vacuum: we can briefly survive in vacuum, even return from it without major injury. Even for our machines, it’s much easier to survive in space than it is to survive elsewhere. Perhaps this should be seen as encouraging… once we master the challenge of getting out of the Earth’s gravity well economically, living in space may not be as hard as it sounds.